Location: North of Alpine in San Diego County. From I-8, take the Tavern Road exit (30). Head left on Tavern Road for 0.2 mile to Victoria Park Terrace. Bear right and go 0.9 mile to Victoria Drive. Go 1.4 mile to Anderson Road (easy to miss; if you find yourself heading back south toward the freeway you’ve come too far). Turn left and follow Anderson Road for half a mile. If the gate is closed, park here and continue up the dirt road to the trail head. If the gate is opened, drive 0.3 mile farther north to a small dirt turnout, shortly before the road starts to go downhill. The trail begins at a small gap in the metal fence on the right side of the road. Alternately from the east, take I-8 to Willows Road (exit 33). Turn left, cross the freeway and make an immediate right onto Alpine Blvd. Go 1.2 miles to Victoria Drive. Turn right and follow Victoria Drive for 1.1 miles to Anderson Road. Turn right and follow Anderson Road to the trail head. Approximate trail head coordinates are N 32.8566, W 116.7421. 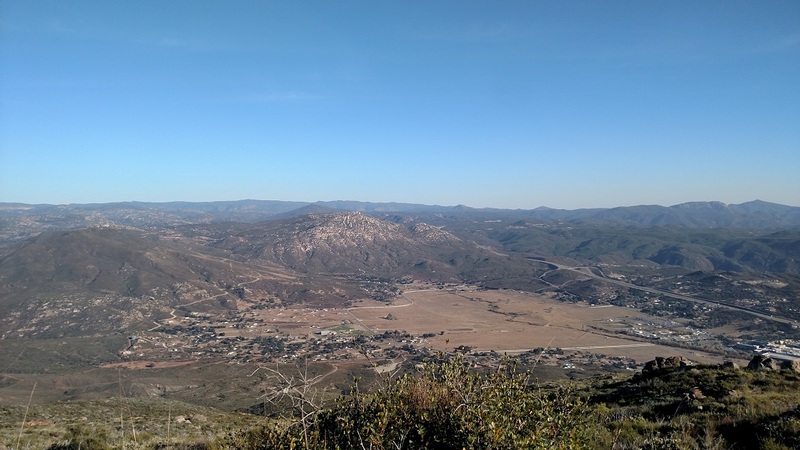 Viejas Mountain (elevation 4,187) is one of the highest points in San Diego County west of the Cuyamacas and south of the Palomars (that is to say, within a short drive from the city and most of the suburbs). Its prominence of 1,627 feet makes for impressive views from the top – at least on clear days. If visibility is not good or the temperature is warm, find another peak, but on cool fall and winter days, if it’s not too windy, the effort of climbing the steep, rocky, exposed trail is well worth the visual rewards. From the gap in the fence, proceed up the hill, gaining an average of 1,000 feet per mile. None of the stretches are particularly brutal, but until you get about 3/4 of the way up, there’s no level area. 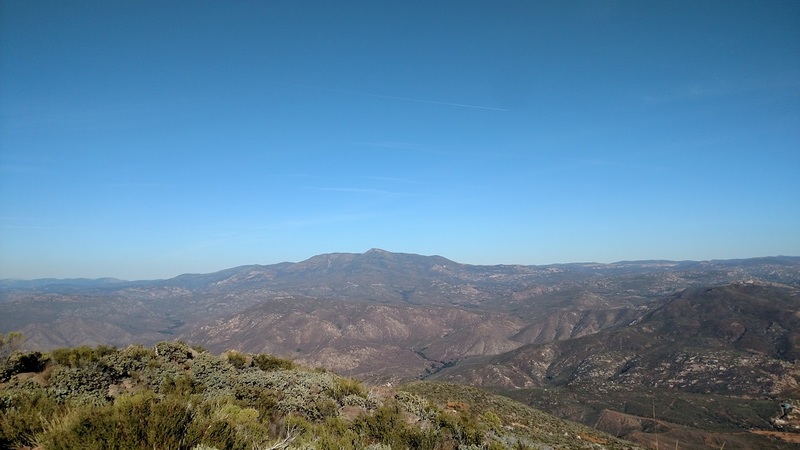 The good news is that the views become better and better as you get higher – notably El Cajon Mountain to the northwest and local peaks such as San Miguel and Mt. Woodson, but you may also be able to see the ocean, the Palomars, and, if you’re lucky, Orange County’s Saddleback. At 1.6 miles, you reach the top of the ridge. 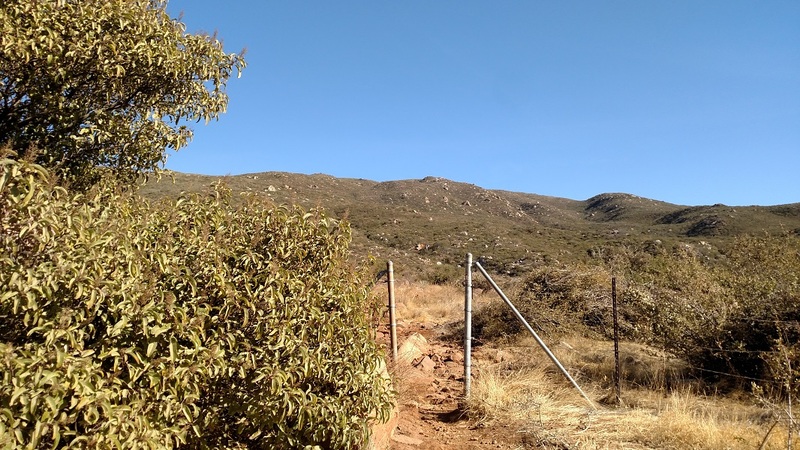 Now your efforts are rewarded, as the views on both sides are excellent: to the west you continue to take in the panorama of almost all of coastal San Diego County and to the east the dramatic sight of the Cuyamacas rising thousands of feet above the valley. The buildings of the Viejas Casino appear like Legos far below. Follow the trail northeast along the ridge. 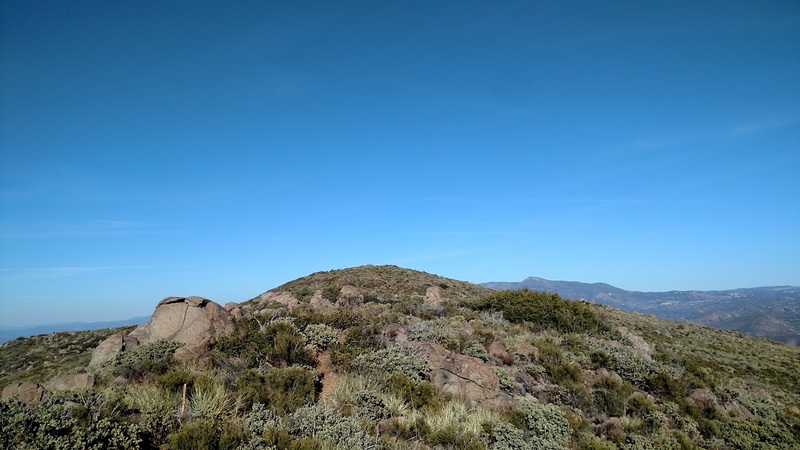 There is some light rock scrambling involved and the trail is overgrown in a few spots but overall the going is much easier than when you were slugging up the west slope of the mountain. Before long you’ll reach the summit, marked by a large rock shelter and an American flag. Enjoy the views while resting your legs for the steep descent.